Laura Maxine Mosher, age 102, died peacefully on September 7, 2018 at her home in St. Johns, MI. Maxine was preceded in death by her brother Harry, her parents, her sister Muriel Pusey, and her husband of 37 years, Carl Bruce “Bob” Mosher. She is survived by her children: Sharon Rose Mosher of Ovid, MI; Robert Carl (Marijane) Mosher of Haslett, MI; and David Michael (Misako) Mosher of Hiroshima, Japan; and two foster children: Kelly Donaldson (Bill) Hohlen of Doniphan, NE; and Donald (Lois) Barrett of Walla Walla, WA. She had eight grandchildren and ten great-grandchildren. Maxine was born on June 2, 1916 in Ashley, MI to parents Robert Bruce and Alberta Belle (Wood) Stevenson. 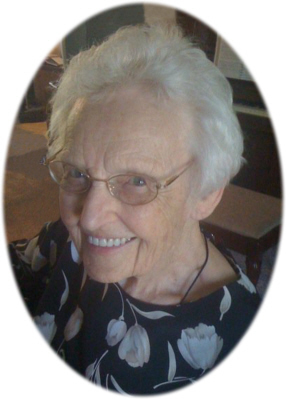 She graduated from Emmanuel Missionary College in 1941 with a degree in Arts and Elementary Education. She worked at many jobs including taxi and truck driver during World War II and as a Kindergarten teacher for 22 years at Scott Elementary School in DeWitt, MI.